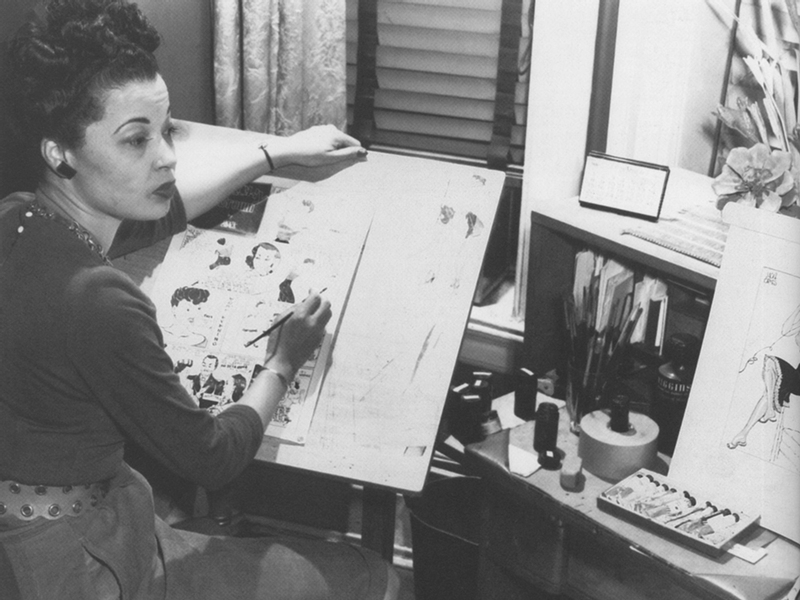 Jackie Ormes (1911-1985), creator of several popular comic strips in the 1930s–1950s, was the first female, African American syndicated cartoonist. In a male-dominated industry, Jackie captured a national audience with her fashionable and opinionated characters. Ormes started out as a proofreader and freelance journalist for the Pittsburgh Courier, a black newspaper which published her first comic strip in 1937. Her debut strip, Torchy Brown in “Dixie to Harlem”, follows a young Mississippi girl as she moves to NYC to become a lounge singer. 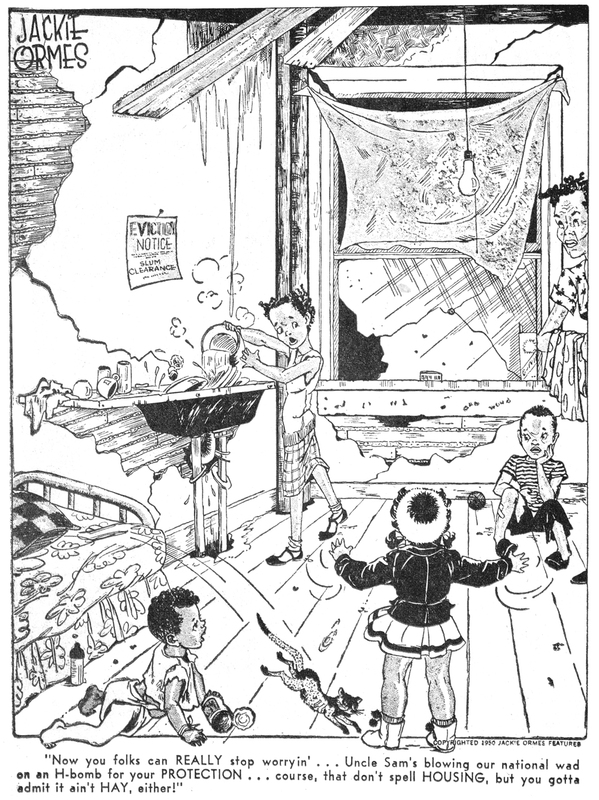 The strip appeared in 15 black newspapers across the country; it was then that Ormes became the only black female syndicated cartoonist until the 1990s. One of the most famous scenes in this year-long strip is when Torchy debates whether to sit in the “colored” section of a train, or to pretend she can’t read and instead site in the “white” section. From the beginning, Ormes’s characters were both glamorous and bold. Near the end of the strip’s run, Ormes moved to Chicago with her husband. In her new city, Ormes worked as a journalist for the Chicago Defender, hung around the art scene, and briefly published a single-panel strip called Candy. 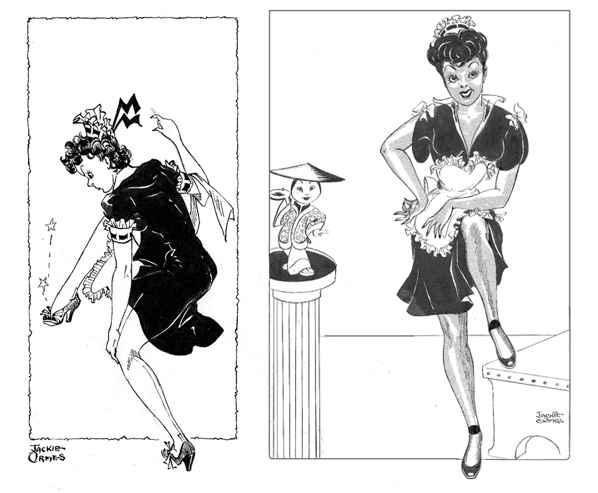 Housemaid Candy was a striking—bodacious—and Ormes used a powerful style to match: the strip was done in bolder strokes than was common. 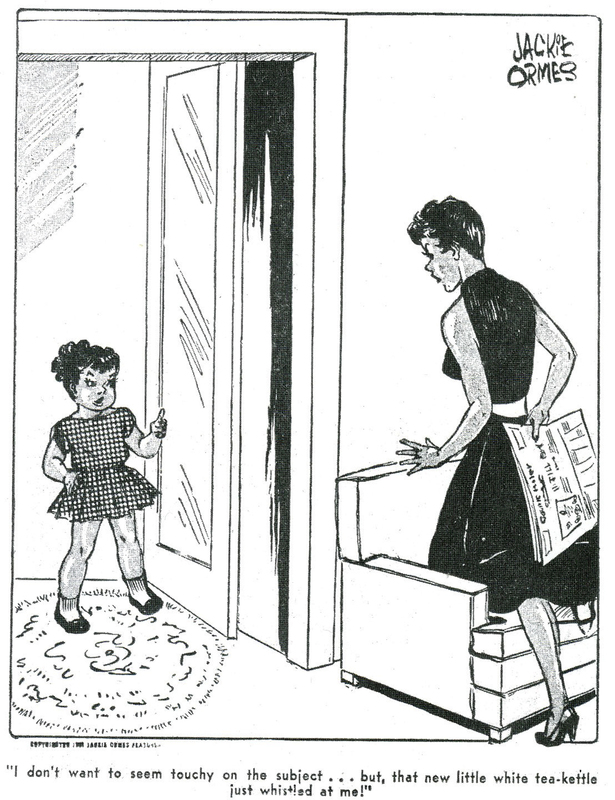 Jackie Ormes sold her next comic, Patty-Jo ‘n’ Ginger, to the Pittsburgh Courier. 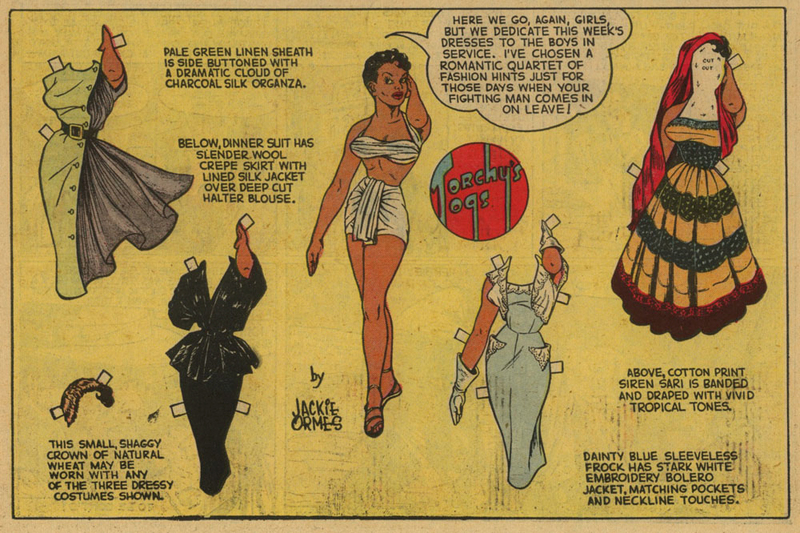 The long-running strip featured a big sister/little sister dynamic and led to the Patty Jo doll (1948). This now-collectible was a big deal—Patty Jo was the first upscale black doll, the first one to have a whole line of clothes. Though Patty Jo did all the speaking, Ginger was a positive role model in her own way. Black characters were often portrayed quite horribly in classic comics, but here was a gorgeous, well-dressed woman in a strip that reached over a million readers. 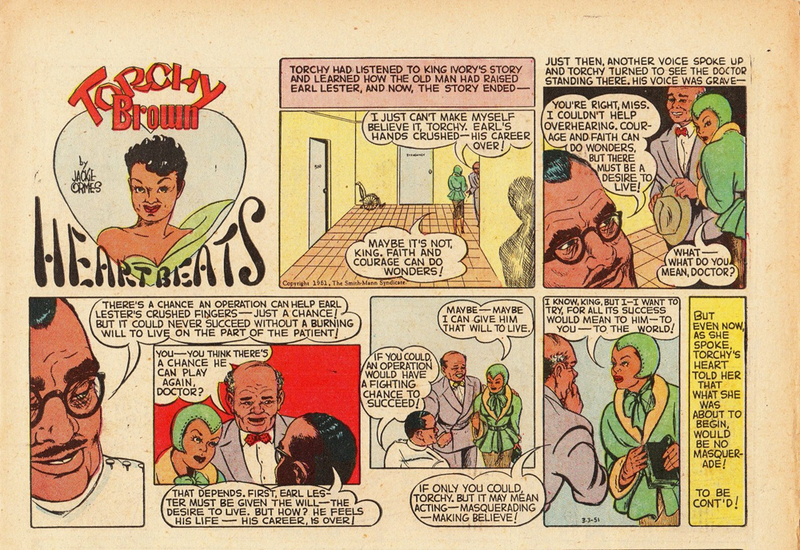 In 1950, Torchy Brown made a comeback in a full-color strip called Torchy in Heartbeats. The comic chronicles Torchy’s attempts to find love, but also serves as a mouthpiece for many of Ormes’s concerns: violence against women, racism, politics, public health. Commentary on environmental pollution might seem par for the course now, but was a topic which made Ormes quite unique. Torchy also appeared in paper doll form, namely Torchy Togs. Torchy cut such an impressive figure that reportedly servicemen used the paper dolls as pin-ups! The Torchy strip ended when Pittsburgh Courier discontinued the prohibitively expensive full-color comics section. Ormes continued working on Patty Jo ‘n’ Ginger, but increasingly her style became looser and she stopped drawing cartoons altogether in 1956. Comic fans can only speculate as to the exact reason(s) why Ormes halted her career. But comics or no, Ormes was an interesting lady: she continued making art, rubbed shoulders with Chicago’s political leaders, and served on the founding Board of Directors for the DuSable Museum of African American History. The McCarthy-era FBI thought Ormes was interesting, too: they compiled a 287-page report on her, apparently because she was seen at a bookstore with Communist figures. Nevermind the political views expressed by her characters—the report never mentioned her comic strips at all. 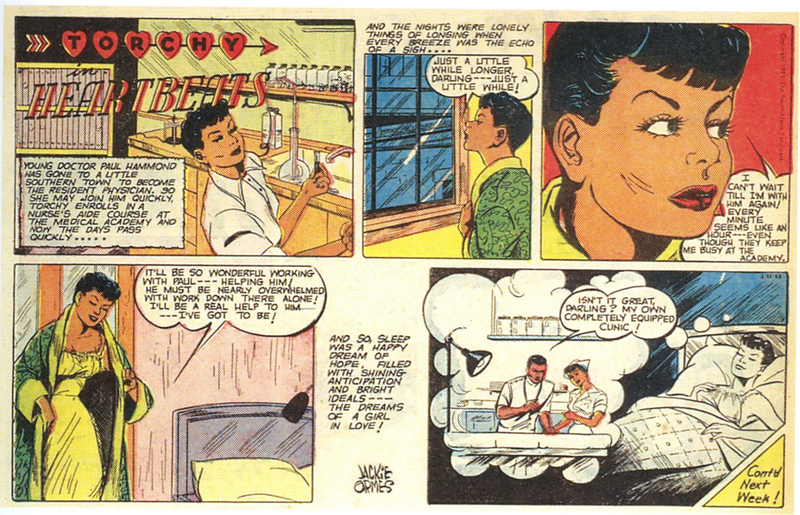 Whether she intended to change the world or simply spoke on what mattered to her, Jackie Ormes was a shining light in popular media. Where many comic artists drew painfully ignorant characters, Jackie skillfully portrayed young black women as intelligent, dynamic, fashionable, ready to take on the world—and for that, she should be celebrated as one of the greats.